Valencia or València, pronounced [baˈlenθja] (bahl-EHN-thyah) in Spanish, and [vaˈlensia] (vahl-EHN-see-ah) in Valencian, is a charming old city and the capital of the Valencian Community. With just under 800,000 inhabitants, it is Spain’s third-largest city and, after Barcelona, the most significant cultural centre along the Spanish Mediterranean coast. It is the capital of the autonomous Valencian Community, and is known for tourism and cuisine. In March visitors flock to the city for the annual UNESCO-listed Falles celebration, but the city is worth visiting at other times of year for its paella, ultramodern architecture, and good beaches. Valentia Edetanorum was established as a Roman colony in the second century BCE. In the early 8th century CE the Moors invaded, and Balansiyya became the capital of the Muslim Taifa of Valencia, thriving as a trading centre for paper, silk, ceramics, glass, and silver. With a brief interlude of Christian control in the 11th century under El Cid, the city remained in Muslim hands until the Christian Reconquista led by King Jaime I of Aragon in 1238, and was incorporated as a kingdom under the Crown of Aragon. Valencia experienced its golden age in the 15th century, with a growing population and flowering of Valencian culture and the arts. Significant monuments from this period include the cathedral’s Micalet, the UNESCO-listed Llotja de la Seda, and the Torres de Serrano (Serrano Tower). During this period it became one of the most influencial cities of the Mediterranean, and helped to fund Christopher Columbus's first voyages to the Americas. In 1609 the Spanish government ordered the expulsion of all Jews and Moriscos from the kingdom to north Africa. Muslim descendants made up about a third of the population of Valencia and the surrounding region, and their forced removal brought about a major economic downturn, and in some nearby communities, economic collapse. It was more than a century before the city began to recover. In the 20th century, Valencia was the capital of Republican Spain from 1936 to 1939, and during the Spanish Civil War sustained heavy bombardment by Franco’s forces, both by air and sea. Franco retaliated for Valencia’s Republican past with cultural and ideological repression, and forbade the use of the Valencian language. In 1957 the Túria River overflowed its banks leading to catastrophic flooding of the old city centre with more than 80 dead. The river was consequently diverted to the south of the city, but it was not until the return of democracy that the original abandoned riverbed was finally converted into a park – now one of the city’s most outstanding features. In the 21st century Valencia has continued to evolve. In 2007 and 2010 the city hosted the America’s Cup, and from 2008 to 2012 hosted the Formula One European Grand Prix. Architecturally, too, the city has changed, most notably with the construction of the Ciutat de les Arts i les Ciències (City of Arts and Sciences) by internationally-renowned Valencian architect Santiago Calatrava. The 2015 election of a new leftist coalition city council, after decades of control by the conservative Partido Popular (PP), brought renewed focus on expanding and improving existing infrastructure, including adding three new metro lines and expanding the city’s already extensive bicycle path network. This ongoing transformation has turned a once little-considered medium city into a meatier and more interesting destination. Summer — Like most European countries, August is a slow month as many of the residents are on vacation. At this time of year Valencia is very hot and humid with temperatures averaging between 30-35°C (86-95°F) by day and 20-25°C (68-77°F) by night. Fall — September and October are more active months and the weather permits beach outings. Important events take place during this season. Winter — Though temperatures are still relatively mild, it's too cold to sunbathe at the beach. It's not unusual though the occasional days reaching around 20°C (68°F) in the middle of this season. Some sidewalk cafés remain open. Spring — A lovely time to visit. The annual Falles festival unofficially marks the beginning of spring. Cafés and restaurants open their terraces and life spills out onto the street once again. Valencia's official languages are Valencian, which is very similar to Catalán, and Spanish. In the capital of Valencia, which is the third largest city in Spain, not many people speak Valencian, nor are they offended if addressed in Spanish. However, outside the capital, Valencian is often preferred. As in Barcelona with Catalán, it helps to be sensitive to this language dynamic. However, the linguistic issue is not as controversial as in Barcelona and most people in Valencia speak Spanish as their first and often their only language. The English-speaking skills of the locals can be hit or miss. Most people under 35 speak some English and some quite a bit, but most would prefer being addressed at first in Spanish or Valencian. French is also spoken or understood by some. 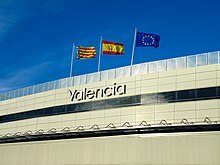 39.489444-0.4816671 Valencia Airport (VLC IATA) (is in the neighbouring town of Manises, 9 km from the city centre). Major airlines serving Valencia from several domestic and European airports are Air Europa, easyJet, Iberia, Ryanair, Transavia, Vueling and Wizz Air amongst others. Wi-Fi is available throughout the terminal (free for the first 30 minutes), and there are a number of restaurants and duty-free shops after security. Metro Valencia lines 3 and 5 go directly to the town centre and link the airport to the main train station, Estación del Norte (beside the Xàtiva metro stop), running every 8 minutes and taking about 21 minutes. A one-way ticket to the city centre costs €3.90, plus an additional €1 for the cardboard ticket with rechargeable chip; tickets can be purchased at a manned service counter (English spoken) and at automats. There are no trains between the hours of midnight and 05:30. Fernanbus operates bus line 150, with buses departing every 15 minutes and terminating at 39.46976-0.388632 Àngel Guimerá, 48, with a full schedule and route map online. Tickets cost €1.50 and the journey takes about 30-40 minutes. A taxi stand is just outside the arrivals hall. A ride from the airport to Carrer de la Pau, in the heart of the historic city centre approximately 11 km away, costs around €20-23 with an additional 'airport supplement' of around €5 (Jan 2015). The tariffs are on display in the taxi in Valencian, Spanish and English but are difficult to see. The same journey back from Carrer de la Pau to the airport is half the price! Book a taxi by calling a radio taxi company or book online at BookTaxiValencia. The main train station is 39.46611-0.377453 València - Estació del Nord (Valencia - Estación del Norte / Valencia - North Station), which is in the city center, next to Plaza de Toros and near the Town Hall (Ayuntamiento). The main building is a well-preserved modernist structure dating from 1917, and had been declared a National Historical Building. This station is only used by suburban, commuter, regional and mid-distance trains. Facilities include a tourist information office, storage lockers, several cafés and a car rental office. The access to underground station Xàtiva, served by Metro València lines 3 , 5 and 9 , is just in front of the main entrance of the train station. Being an important hub for the public transport network of the city, the location is served by several bus lines wich allow connection to any district or neighbourhood of Valencia. Long-distance and high-speed (TGV, Euromed) trains arrive at 39.45901-0.381294 València - Joaquim Sorolla (Valencia - Joaquín Sorolla) train station, 800 m from the main station. Facilities at this station include storage lockers, a café and car rental office. A free shuttle bus connects the station to València - Estació del Nord with a departure every 10 minutes. This station is served by Metro València lines 1 , 2 and 7 , using the underground station Jesús. The national train company is Renfe. Tickets can be booked online on their website, where significant discounts ('Web' and 'Estrella' fares) are available for early bookings. Valencia is connected with Madrid by AVE high-speed trains, that run over the Madrid–Levante high-speed rail line. The journey takes approximately 1 hour 35 minutes. Other major cities, such as Barcelona, are connected with Valencia by Euromed, Alaris, or Talgo trains. The journey to Barcelona takes approximately 3 hours. Streets in Valencia have two names, Valencian and Spanish, but most street signs are in Valencian only. Maps may list street names in Valencian or Spanish and rarely both, while addresses may be given in either language, which could create some confusion. Addresses in this guide are generally listed in Valencian. The city has begun changing some Franco-era street names to those commemorating other figures, especially women. By late 2017, about 50 streets had been renamed, with more planned; online mapping services are largely up-to-date but printed maps will likely not be. Travellers visiting for a short period may want to consider purchasing a Valencia Tourist Card, a one-, two- or three-day pass which allows for unlimited travel on all metro and bus lines, including to/from the airport, over a period of 24 hours (€15), 48 hours (€20), or 72 hours (€25). The card also includes free admission to public museums and monuments, discounted admission for other tourist attractions, and additional discounts at some shops and restaurants. The card can be purchased at any tourist office, including at the airport, or purchased online for a discount and picked up on arrival at a tourist office. For travellers staying longer than three days, a rechargeable Bono transbordo card, valid for both metro and bus travel, provides a flexible means of getting around. The card allows for ten journeys, which include all transfers begun within an hour of commencing your journey. These cards are sold in ticket offices in metro stations, and as of early 2018 cost €9. There is an additional one-time €2 fee for the chip and plastic card. The cards can be recharged at any metro ticket machine. The EMT (bus) website has a very helpful route-planner, useful for planning journeys not only by bus but also by metro, bicycle, and Valenbisi (see the bicycle section below). The Metro Valencia consists of nine lines (three of which are tramlines) and connects the suburbs with the city. This metro system is not extensive, but can get you to major points within the city. Maps and timetables can be downloaded here. As of 2018, the one-way fare for a single zone is €1.50. The ticket costs an additional €1 and contains a rechargeable chip. Make sure you keep your ticket as you must beep yourself out as well. If you want to take only the tram, you must buy a ticket from the machine (at each tram stop), and then validate it before you get on. If you use the metro a lot, you should consider getting a Bonometro, a rechargeable chip card, available at ticket machines in metro stations, which allows for ten rides in Zone A and as of late 2016 costs €7.20. There is an additional one-time €1 fee for the chip and cardboard ticket. These same chip cards can also be used for single journeys (e.g. to the airport or outlying areas), but a card cannot contain both types of tickets – you can change the type of fare only after you've used up all of your Bonometro rides. If you plan to make a number of journeys outside of Zone A, you will likely have to purchase a second card. Standard bicycles are permitted during the workweek only on portions of the network which operate above ground. On Saturday, Sunday and holidays they are permitted throughout, while folding bicycles may be transported at any time. No bicycles are permitted at all during Fallas and the night of San Juan. Pets in carriers and guide or personal assistance dogs are also permitted. EMT runs buses to virtually every part of the city, both day and night. A single ticket costs €1.50 (no transfers), payable to the bus driver on entry. For frequent travellers, a more price-effective option is to purchase a rechargeable Bonobús card, available in kiosks and tobacco shops, which will allow you ten rides for €8.50 (as of early 2018). There is an additional one-time €1 fee for the chip and cardboad ticket. These cards can be recharged at kiosks or online. For travellers with smartphones, there is a very helpful official EMT app (iPhone and Android), which has a route planner and a QRT reader. Most bus stops now have digital displays listing the arrival times for the next bus. At those stops lacking the digital display it is still easy to find out the next arrival times, by using either a QRT reader (like the one built into the EMT app), or by sending a SMS with the unique number of the bus stop to a number displayed next to the posted route plan. Valencia is essentially flat, and cycling has become a popular way for visitors to get around. The city has established a comprehensive network of dedicated bicycle paths and lanes, and the Turia river park very conveniently cuts across the city, making it possible to get from one end to the other with minimal time in traffic. Drivers are now accustomed to interacting with cyclists in traffic, although pedestrians still occasionally wander into bike paths. Riding on sidewalks without demarcated bicycle paths is not permitted, but this is generally not enforced. At night lights are required, and a helmet and reflective vest are recommended. A bicycle route map can be downloaded here. 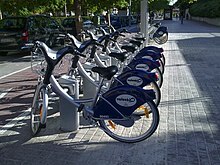 The city operates Valenbisi, a popular bicycle sharing program, with 275 stations distributed throughout the city. No reservation is necessary – once you have a Valenbisi card, go to the interactive station terminal, follow the instructions in Valencian, Spanish or English, and choose a bicycle. You can return the bicycle to the same or any other station with available docks. A short-term subscription costs €13.04 and gives you access to unlimited use of the bikes for 7 days; the first half-hour of any journey is free, then €1.04 is charged for the first two additional half-hours, with €3.12 charged for every additional hour. However, if you park the bicycle in an available dock before the first half-hour is up, you can take out a new bicycle and reset the clock for no additional fees. Weekly cards can be purchased at any station terminal with a credit card. For periods longer than one week, an annual subscription is necessary and costs €27.12, with reduced tariffs for each additional half-hour. These cards must be purchased online and are sent by mail; however it is possible to bypass this hassle and attach your Valenbisi subscription to a valid Bonometro, Bonobús, or Bono transbordo card – see the website for details. There are also many bicycle rental shops in town, with most charging around €10-15 a day, depending on season. 39.47382-0.374019 DoYouBike, Carrer del Mar, 14 (near the cathedral), ☎ +34 963 155 551, e-mail: info@doyoubike.com. Daily 09:45-14:00, 17:00-20:15. Rents bikes at relatively reasonable prices. €2/hour, or €9/day during the week, €12/day on weekends, helmet and pump €1. In the city, especially the centre, having a car is more of an impediment than an advantage, and visitors may well find it easier to just park it and walk. 39.454527777778-0.350363888888891 Ciutat de les Arts i les Ciències (Ciudad de las Artes y las Ciencias / City of Arts and Science), Av Autopista del Saler, 5 (take a city bus from the train station or the metro to Alameda station), ☎ +34 90 210 0031. Call Centre: M-F 09:00-20:00, Sa 10:00-20:00, Su 10:00-15:00. This ultra-modern architectural complex on the former Turia riverbed was designed by Valencian architect Santiago Calatrava and Spanish-Mexican architect Félix Candela. If you don't want to pay the steep admission charges to the individual sights, you can wander around the complex and appreciate the architecture from outside for free. Combined admission for all sights: €36.25 (adults), €30.85 (students), €27.55 (other concessions); valid for 3 days, however the same venue cannot be visited twice. There is a 10% discount for tickets purchased online. 39.47613-0.3788112 Església de Sant Nicolau (Iglesia de San Nicolás / Church of San Nicolás), Carrer dels Cavallers, 35, ☎ +34 963 913 317, e-mail: info@sannicolasvalencia.com. Oct-Jun: Tu-F 10:30-19:00, Sa 10:30-18:30, Su 13:00-20:00; Jul-Sep: Tu-F 10:30-21:00, Sa 10:30-19:30, Su 11:30-21:00. Established in the 13th century, the church was expanded in several phases, culminating in the current 15th-century Gothic structure. During the late 17th century extensive Baroque renovations were carried out to the interior, the most significant of them being ceiling frescoes. This remarkable set of frescoes completely covers the vault of the nave and the presbytery, and illustrates the lives of St. Nicolás and St. Peter. They were designed by the Italian master Antonio Palomino and painted by his student, Dionis Vidal, and have been completely restored. Go around and see the various fallas, but especially the Secció Especial. See la mascletà and la nit de foc. See one of the various parades, especially the ofrenda, and see the Virgen de los Desamparados. Sample bunyols (Spanish: buñuelos), traditional Valencian ‘donuts’, at one of the many stands on the street. They are only available during the Falles season, and come in several varieties, including chocolate and carabassa (Spanish: calabaza, or pumpkin). Dance all night long at one of the verbenas (temporary bars and nightclubs) set up on the street. Most streets in the city centre are closed to everything except pedestrian traffic, and buses running through the centre will be diverted from their usual route. Most restaurants are very crowded and some are not open. There are usually very long waits and slow service and you should plan for this in your schedule. Hotels should be booked well in advance. Many people throw firecrackers near pedestrians and it is possible to be burnt or injured. Some of the principal fallas, like Nou Campanar, are well outside the city centre and are quite far by foot – it is much easier to take the metro or a bus. One of Spain’s most spectacular fire festivals, Falles (Spanish: Fallas) can be best characterised as a fire-fireworks-gunpowder street party extravaganza. The festival draws up to two million visitors annually, and is listed as a UNESCO ‘intangible cultural heritage’. Its origins date to the Middle Ages when the city’s carpenters burned piles of scraps in the streets and plazas near their workshops on 19 March, the eve of the day of San Josep (Spanish: San José, or St. Joseph). In the 18th century, it became customary to fashion these piles of junk with papier mache into human figures and sculptures, called ninots (Valencian for 'dolls'), which were assembled to form larger fallas. Eventually these fallas began to take on a satirical nature. Around 1870, Falles and Carnival were banned. In response to this, a popular movement arose to revive and preserve these traditions, resulting in a competiton in 1885 for the best and most artistic falla. This prompted the development of casal fallers, neighbourhood associations which work year-round raising money and designing their fallas. Today there are about 400 casal fallers which each design an adult falla (falla mayor), and a smaller children’s falla (falla infantil); more than 400 of these fallas are burned on public streets every year. Many fallas reach 25-30 m in height – the best of these are in a special category Secció Especial (Spanish: Sección Especiál) and compete for the top prize, awarded annually by the City Council. A secondary feature of Falles are daily fireworks events, including gunpowder demonstrations (mascletàs) and large nightly fireworks displays (castillos del fuego). Along with these displays, people set off fireworks all day in the streets, beginning early in the morning and continuing throughout the day, making the city seem like a war zone and making it very difficult to catch any sleep. If you can't be in Valencia at the time of the festival, you can at least get an idea of what it's all about by visiting one or both the following museums. Semana Santa Marinera (Setmana Santa Marinera / Marinera Holy Week) (Cabanyal). Week before Easter Sunday. As elsewhere in Spain, Valencia celebrates Holy Week with street processions of penitents, organised into fraternities. 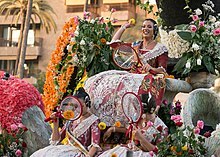 Although not as well known as the more elaborate processions in Andalusia and Castile and Leon, Valencia's own unique traditions date back to the 15th century and are centred in the neighbourhood of Cabanyal, formerly an independent fishing village. Especially noteworthy are the Good Friday morning processions: two separate fraternities carry a crucifixion effigy to the beach, say a prayer for those who have lost their lives at sea, and place a laurel wreath in the ocean. This practice is unique in Spain and has been designated a 'Fiesta of National Touristic Interest' by the government. Festa del Corpus Christi (Fiesta de Corpus Christi). 60 days after Easter, usually late May or early June. The city has been celebrating Corpus Christi since the late 13th century, and holding feast day processions since 1355. The main procession, known as the Cavalcada del Convit (Spanish: Cabalgata del Convite) begins at 12:00 and follows an itinerary established in the 18th century, which begins at Carrer de la Batlia, heads south along the western side of the cathedral to the Plaça de la Reina, and then up Carrer d'Avellanes and finally terminates at Plaça de l'Almoina. The parade features several medieval dances and rituals unique to Valencia, the most famous of which is La Moma i els Momos, in which a man in white dress and white-veiled face is surrounded by seven men clothed and veiled in black; the dance represents the fight of virtue against the seven deadly sins. Also noteworthy are the dances of the Nanos (dwarves) and Gegants (giants), in which dancers wear oversized heads and costumes respectively, and La Poalà, in which participants at the end of the route are doused with buckets of water. Nou d’Octubre (Diada Nacional del País Valencià / Valencian Community National Day). 1-9 October. This annual public holiday has been celebrated since 1338 and commemorates the date in 1238 when King James I of Aragón entered the city, freeing it from Moorish rule. In the week leading up to the 9th there are free concerts and parades around town, including a correfoc ('fire-running') which takes place on the preceding Saturday evening in the El Carme district. During this same weekend nine governmental palaces which are ordinarily closed to the public are opened for general visitation (Sa and Su 10:00-20:00, free admission). Of these the 15th-century Gothic 39.47665-0.3763165 Palau de la Generalitat (Palacio de la Generalidad / Palace of the General Assembly) is the most remarkable, and is well worth the long queue to see the well-preserved interior. Formal festivities commence at midnight on 8 October with a fireworks display from the Túria River park by the Pont de l'Exposició (by Alameda metro station). At noon on the following day a formal procession carries the Valencian flag from the Ayuntamiento (City Hall) to the 39.47191-0.3705766 Jardí del Parterre (Parque del Parterre / Parterre Park), where a wreath is laid before the equestrian statue of King James. The highlight of the 9th itself is the parade of Moros i Cristians (Spanish: Moros y Cristianos), which commences at 39.47269-0.3700811 Plaça d'Alfons el Magnànim and proceeds down Carrer de la Pau and Carrer de Sant Vicent, finally terminating at Plaça de l’Ajuntament. The parade starts at 18:30 but it is best to find a spot about a half-hour before the parade begins. There are two city beaches, and several major beaches outside of Valencia. 39.4661-0.321712 Platja del Les Arenes (Platja del Cabanyal / Playa de las Arenas), just north of the port, has a pleasant promenade with a number of traditional (and expensive) restaurants, bars, and ice cream shops. The more northern 39.479-0.323513 Platja de Malvarrosa begins where the promenade ends, and is the setting for volleyball tournaments, kite festivals, and windsurfing. In the summer both beaches have lifeguards and first aid stations, toilets, and snack vendors, and are very crowded especially in the afternoons. To get there, take the metro or tram to Eugenia Vines or Arenas station, or take the metro to Maritim Serreria and continue with the tram to Neptu (all on one ticket). To the north of and immediately adjoining Malvarossa is 39.4887-0.324114 Platja de la Patacona (Playa de la Patacona), which, although part of the municipality of Alboraya, is easily accessible from Valencia by public transport or foot. This beach is somewhat less crowded, and is also a good place to sample horchata, as Alboraya is a major producer of chufa, a key ingredient of the drink. The beaches south of Valencia port are all part of Albufera Natural Park. They are generally well-maintained and far less crowded than the urban beaches, and easily reachable by public transport. Bullfighting (corrida de toros). Bullfights are staged in Valencia only during three short seasons, including Falles (mid-March), the Fira de Juliol (July Festival), and the Nou d’Octubre (Valencian National Day in October). 39.46663-0.3761415 Plaça de Bous de València (Plaza de Toros de Valencia), Carrer de Xàtiva, 28 (next to North Train Station), ☎ +34 902 10 7777. A bullring and artistic monument, it is used for bull fighting and big shows. The stadium holds 12,884 people, and was built between 1850 and 1860 by Valencian architect Sebastián Monleón Estellés. Football (soccer). Two teams here play in La Liga, the top tier of Spanish football. Valencia CF play at the 49,000 39.47461-0.3582416 Mestalla stadium 1 km northeast of the city centre; they are overdue for moving to their still uncompleted 39.48946-0.3965417 Nou Mestalla stadium to the northwest. Levante UD play at 39.49469-0.3638318 Ciutat de València Stadium, capacity 26,000; it's 2 km north of the centre, near the Machado metro stop. The area around 39.4721-0.373521 Plaça del Patriarca (Plaza del Patriarca) is a good place to look for the major national brands like Loewe, LLadró, Louis Vuitton, Dolores, and Farrutx. To recognize 'real' local paella from tourist junk, avoid any places with large paella pictures on the door step. This is a sure sign for frozen/microwaved paella. When possible, make reservations or arrive early (no later than 14:00), especially on Sunday, because these restaurants fill up quite quickly on the weekend. Paella is typically eaten at mid-day (between 14:00-17:00), so many restaurants do not serve it at dinner. Be careful of those that do as this is not the custom here and the quality of the paella may be poor. 39.48015-0.3798531 La Tastaolletes, Carrer de Salvador Giner, 6 (El Carme), ☎ +34 963 921 862. Tu-Sa 14:00-16:00 21:00-24:00, Su 14:00-16:00. Vegetarian. There are many bodegas and tapas bars where you can get typical Spanish dinner for quite good prices. If you arrive early (the Spanish early) at about 20:00 they usually have special offers like tercio y tapa for about €1. To find them orient more to the parallel streets to Carrer de Doctor Manuel Candela. Later to drink something occupying the time between dinner and going out there are many bars with different kind of music present. Turia, a toasted lager, is the best-known local beer. It was first made in 1935 but didn't go into full production until 1947, due to the Spanish Civil War. Barrio del Carmen is a major nightlife destination in Valencia. There are numerous restaurants, bars, and dance joints, which tend to cater to a youngish crowd, in particular along Carrer dels Cavallers (Calle Caballeros). 39.47168-0.3471414 Plaça del Cedre (Plaza del Cedro) is a nice area where all possibilities are given to spend a night partly o complete in less touristic ambiance than in the center. Additionally there is typical Spanish nigh-life feeling on the plaza itself. Different kind of people enjoying the mild Mediterranean clime to sit outside talking, drinking and playing guitar often until the sunrise. Other centres of are night-life are 39.46831-0.3657315 Plaça de Cánovas del Castillo (more upscale), along Carrer de Joan Llorenç (young also, less "alternative"), around the main campus of the University of Valencia (for students), and increasingly in the area near the beach and port. If you feel like dancing there are four famous pubs where especially at the weekends a lot young people can be found. The entrance is normally for free and they are almost neighbors in Carrer de Campoamor. The music is more alternative (Rock, Indie, Pop) than general in Spain but it changes depending on the DJ. So just have a look to all of them to find the one you like most. They close at half past three in the morning and if you don't want to be alone maybe the best time to arrive is between half past one and half past two. 39.47605-0.37251511 Bed & Breakfast Almirante, Almirante, 3, ☎ +34 963 916 551, fax: +34 963 925 501, e-mail: info@bedandbreakfastalmirante.com. Check-in: 13:00, check-out: 11:00. In a quiet area of the center of Valencia, 2 minutes' walk from the cathedral. 39.47398-0.3727723 Orange Habitaciones, Carrer del Trinquet de Cavallers, 3 (Xerea), e-mail: info@orangevalencia.com. Check-in: 13:00, check-out: 11:00. A nice boutique hotel 15 minutes' walk from the center. Rooms are decorated in orange, which gives you the feeling of Valencia as soon as you check in. €50/single. The city of Valencia has set up more than a hundred free Wi-Fi hotspots in public parks, libraries, and some municipal buildings and cultural centres. For visitors the most accessible are in the Jardí del Túria (11 spots between the Palau de la Música and the Museo de Ciencias Príncipe Felipe), Palau de la Música (2 spots), Jardín de Viveros (5 spots), Plaça de l'Ajuntament (6 spots), Museu d'Història de València (1 spot), Mercado Colón (1 spot), and at the seasonal 39.46745-0.32312 Bibliomar (on Platja del Les Arenes near the Hotel Balneario, Aug-Sep). The McDonald's in the Plaça de la Reina and many other restaurants and cafés also offer free WiFi. Albufera Natural Park — A fresh water lake which is part of the protected natural space, composed of the lake and surrounding marshy areas, as well as the pinewood and sandy dunes and beaches of El Saler. Rice is cultivated in the surrounding area of the lake. The Albufera also hosts many interesting varieties of migratory birds. The village of El Palmar is also a good place, if not the best, to try some paella or other local dishes. Manises – 15 km northwest of Valencia, it is not only the site of Valencia's airport, but is also an important center for pottery. The city can be easily reached by Valencia's metro lines 3 and 5. Paterna – This bedroom community 5 km to the northwest is known for its cave dwellings, Moorish tower, and Moors and Christians Festival. El Puig – 15 km north of Valencia, this village is best known for its impressive Gothic monastery, and is easily visited as a half-day trip from the city. Torrent – 9 km southwest of Valencia, the second largest city in Valencia province has a couple of interesting sights. Rent a car and do a day trip to any number of picturesque villages or small cities in the region, including Chulilla, Sot de Chera, Xàtiva, and Sagunto, among others. La Tomatina, hosted by nearby Buñol on the last Wednesday of August. A festival that involves thousands of participants throwing ripe tomatoes at each other. Make sure you wear clothes that you can throw out after wards, as it gets very messy. Cullera, is the nearest beach resort from the city, apart from the more aimed at locals Pobla de Farnals, and worth a day visit from Valencia if you have time. It is settled down an isolated mountain (with a big white sign saying "Cullera" on it) beside a beautiful bay. It has crowded and quiet beaches. The most quiet ones are along the lighthouse road. There is also a naturist beach right North of Cullera, in Playa del Dossel, with a tricky road to access it. There is a castle on top of the mountain from which to enjoy stunning views. Gandia, 65 km south of Valencia and easily accesible by regional train, is the historical capital of the ancient Dukedom of Gandia, origin of the infamous Borgia (Borja) family, whose Ducal Palace is worth the visit, and birthplace of fideuà. Montanejos, with its scenic mountains, gorges, and hot springs. This city travel guide to Valencia has guide status. It has a variety of good, quality information including hotels, restaurants, attractions and travel details. Please contribute and help us make it a star! This travel guide page was last edited at 12:45, on 4 April 2019 by Wikivoyage user StellarD. Based on work by Wikivoyage users Ground Zero, Traveler100, Traveler100bot, ShakespeareFan00, MartinJacobson, Grahamsands and Mx. Granger, Wikivoyage anonymous users 92.3.119.255 and 79.132.235.25 and others.